oughnuts, eggs, sea lilies, bottom-fixed sea cages, salmon ships. Development licences have triggered the biggest collective brainstorming and innovation drive that the aquaculture industry has seen for decades. “The issuing of development licences will help develop technologies that can solve the environmental and spatial challenges facing the aquaculture industry,” said then Fisheries Minister Elisabeth Aspaker, when she launched the scheme in November almost two years ago. Both the government and large parts of the political opposition have made it plain that they would like to see significant growth in the aquaculture industry. Most are aiming for a five-fold increase in today’s output in the years to 2050. “To achieve that, we must facilitate the development of new technology. Development licences will help provide the technological boost and restructuring that the industry needs,” said Aspaker. And the development licences really have speeded up the generation of ideas, and shown just how creative an industry can be when it is thirsting after growth opportunities. A stream of applications has given the bureaucrats at the Directorate of Fisheries more than enough to be getting on with. At the close of June this year, a total of 60 applications had been submitted for a total of approx. 500 licences. Here are creative projects with just as creative names, like “Sea Lily”, “Stadium Pool”, “Donut”, “Egg” and “Pipefarm”. But the hurdles to winning approval have proved extremely high. Too high, some may claim. By the start of July this year, only five different projects had been granted a total of 27 development licences. In all, these five projects had applied for 81 licences. At the same time, the Directorate of Fisheries had not yet completed its assessment of 30 applications for a total of 325 licences, while it had already rejected 16 applications for a total of 90 licences. Some of the rejections have been appealed to the Ministry of Trade, Industry and Fisheries. Of the few that have been given the go-ahead, some are uncertain about whether to proceed. They feel they need more licences before they are willing to take the financial risk involved in realising sometimes extremely capital-intensive ideas. There is no doubt that the development licences scheme has unleashed the aquaculture industry’s innovative power. It remains to be seen whether it will also lead to the sought-after growth. 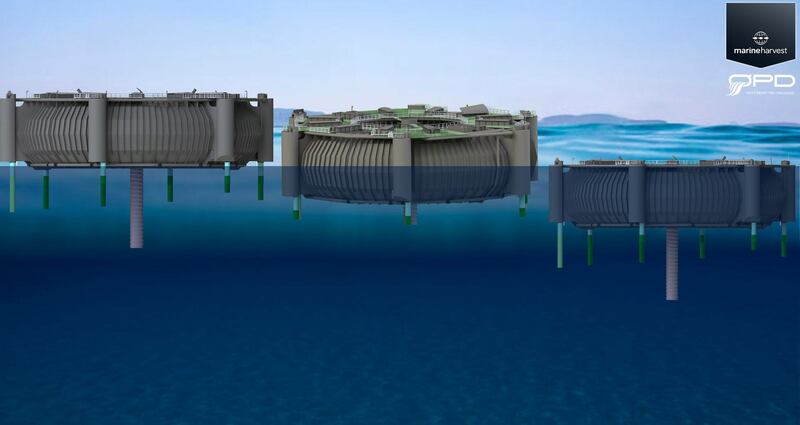 Lerøy Seafood has applied for nine development licences for a floating, closed-containment longitudinal-current fish farm that has been dubbed the ‘Pipefarm’.